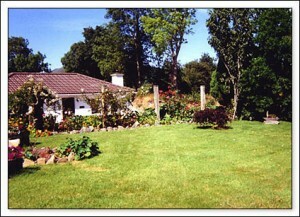 Dan’s Cottage is 4 star modern cottage built in the traditional style in peaceful setting. Excellent location on the grounds of Kenmare House (formerly Annagry House). Kenmare Town Centre is only a 6 minute walk on footpath with streetlights. Casey’s Restaurant & Pub, Kenmare Bay Hotel with Leisure Centre and swimming pool are just 300 metres away. Spacious and luxurious bedroom with King size four-poster bed, en-suite with bathtub and shower. TV and DVD, radio and CD player, washing machine and dryer, wood burning stove and oil-fired central heating are all included. Private parking. Electricity and oil are extra.